If you were shopping for a mortgage and a bank offered you an extra low rate on a 1-year adjustable-rate mortgage, you’d probably scoff at the idea. Why on earth would anyone take out a high-risk ARM with a very limited fixed period at a time when fixed mortgage rates have rarely been lower? A new analysis put together for the WSJ by Lender Processing Services revealed that jumbo lenders are originating a large share of 1/1 ARMs, those that are fixed for the first year before becoming annually adjustable. In fact, more than 75% of private-label jumbos ARMs originated this year were 1/1 ARMs, as opposed to say 30-year fixed mortgages, which are extremely well-liked by the rest of the population. 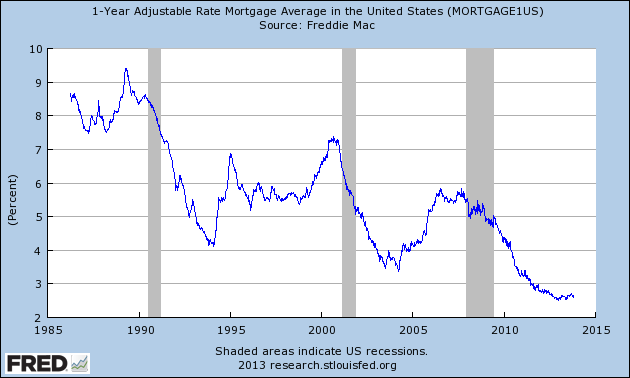 If you look at mortgage refinancing alone, the numbers are even more 1/1 ARM-happy. In fact, 96% of private-label jumbo ARMs were 1/1 ARMs in August, up from 84% back in January. So those with jumbo loans are increasingly going with very short-term ARMs, despite the 30-year fixed hovering close to 4% and the 15-year fixed averaging close to 3.25%. What’s the Upside to the 1-Year ARM? The path of the 1-Year ARM since 1985. Well, these 1/1 ARMs have start rates around 2.5%, which will save jumbo borrowers some serious cash. Let’s say we’re talking about a $1 million dollar loan amount. If the homeowner is conservative and goes with a 30-year fixed set at 4%, they pay $4,774.15 per month. If they opt for a 1/1 ARM with a start rate of 2.5% instead, they’d be looking at a monthly mortgage payment of $3,951.21 for an entire year. Over the first year alone, this homeowner would save nearly $10,000, or about $825 per month. Once the loan adjusts after a year, it would be based on the margin, say 2.25%, and the index, which if tied to LIBOR, would be dirt-cheap, still under or close to 3%. So this hypothetical jumbo borrower could save thousands and thousands of dollars, and invest the excess in the stock market or wherever else to gain a better return. Of course, if and when mortgage rates do rise, this strategy wouldn’t make a lot of sense, and could actually burn the homeowner in question. Sure, there are caps that limit how much an ARM can rise during a certain period, such as a year, but it wouldn’t take long for the 1/1 ARM to exceed the rate of a fixed mortgage at these levels. However, jumbo borrowers don’t seem to be deterred. Even Facebook founder Mark Zuckerberg reportedly has a short-term ARM, though there’s a glaring difference between him and the rest of us. He can pay off the loan in its entirety pretty much whenever he wants to. And he probably will once rates finally rise to unattractive levels. For the rest of us, opting for a 1/1 ARM carries a lot of risk. Once rates rise, you might have trouble actually making the higher mortgage payment each month. Additionally, for those with smaller loan amounts, the difference in monthly payment between a short-term ARM and a fixed mortgage probably isn’t all that significant, hardly worth the risk. 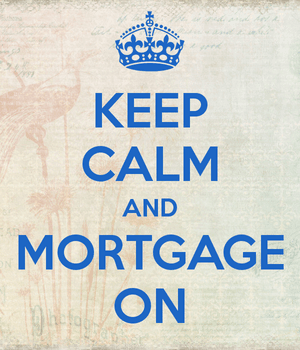 Not only that, but you could get caught out if you simply plan to refinance once rates rise. A refinance is never guaranteed. You could lose your job, see a drop in income or credit score, or get denied for a countless number of other reasons. This explains why most borrowers opt for long-term fixed mortgages and/or hybrid ARMs with a reasonably long fixed period, such as the 5/1 ARM and the 7/1 ARM. Both provide initial rate discounts, but remain fixed for five and seven years, respectively, which makes them a lot less speculative.